Leeds fans have been reacting to the news that Liam Cooper and Andy Lonergan will miss Saturday’s clash with Sheffield Wednesday. 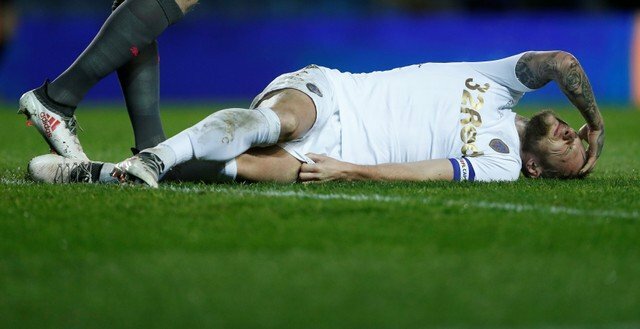 Centre back Liam Cooper and goalkeeper Andy Lonergan are both set to be out for extended periods, says Leeds manager Paul Heckingbottom. Cooper was enduring a poor spell of form and taking plenty of stick from fans, and sustained his injury in the loss against Wolves. The captain was clattered by his own player, suffering a severe dead leg. Fans don’t seem all that sympathetic about the injury. Lonergan had missed several games with a neck injury, and is now set for a longer spell on the sidelines after aggravating the injury. The 34 year-old probably doesn’t hold much hope of getting back in the team now, after the sudden emergence of Bailey Peacock-Farrell. Leeds host Sheffield Wednesday on Saturday, still seeking their second win in the calendar year. The injury to Lonergan won’t impact the lineup, but Cooper’s injury means Everton loanee Matthew Pennington will likely keep his place. These are the best two injuries that we’ve had recently! Anything they can do to keep his leg swollen phil? Any chance we can get useless okane to hurt himself too?